We listened to our Halloween play list while eating our dinner: penne with a pumpkin cream and sage sauce; quesadillas cut to look like jack-o-lanters, and fruit salad. We mulled apple cider while we were out, and then we came back and sorted Katie's candy while sipping the warm drink. We closed up the house at 8:00 PM, the kiddos' bedtime, but in truth we had very few people this year. We made a festive time of it, however! Carving our pumpkins. Katie chose happy faces for both this year---she is definitely not into scary things! A dalmatian, a cat, and a pumpkin. 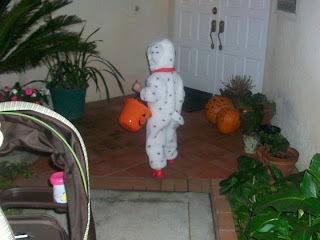 Katie knew she wanted to be a doggy (her very favorite animal) months and months ago. When I asked her this past summer what I should be, she wanted me to be a cat to go with her dog. I chose Eric's pumpkin costume after he was born.